Billy King is about to open the scoring for Moulton Harrox against ICA Sports. Photo: Tim Wilson. Netherton United were knocked off the top of the Peterborough Premier Division after a shock 3-0 reverse at mid-table Stamford Lions on Saturday (November 5). 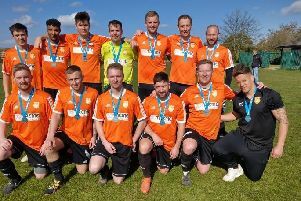 Will Thomas, Sean O’Donnell and Jack Travers scored the goals for a Lions team slowly finding their feet in the top flight after winning the Division One title last season. Moulton Harrox go 2-0 up against ICA Sports. Photo: Tim Wilson. Reigning Premier Division champions Moulton Harrox have moved back to the top after their hard-fought 3-1 win over in-form ICA Sports. Billy King struck early for Moulton before goals from Ashley Coddington and Joe Townsend settled the destination of the points. Centre back Kane Gilbert replied for the city side. The Premier Division title race could become a battle between South Lincs clubs as Pinchbeck United are also serious contenders for top spot. That much was confirmed by a key 3-1 win at high-flying AFC Stanground Sports which made it 10 wins in all competitions for Pinchbeck, and seven succesive top-flight wins. Action fron AFC Stanground Sports (blue) against Pinchbeck. Photo: David Lowndes. Leading marksman Ollie Maltby, Tom Panton and player-boss Ian Dunn scored the goals. Maltby now has 19 goals in 13 matches after converting a spot-kick, while Dunn was scoring for the first time this season. Pinchbeck overcame the loss of a goal to Daniel Stephens in the first five minutes, and the loss of goalkeeper Ricky Lovelace to injury after 30 minutes. Tom Edwards also missed a penalty after Stanground had been reduced to 10 men following the dismissal of Jack Dean. Defender Bradley Murrell went in goal after Lovelace’s departure and kept a clean sheet. The first choice number one could be out for eight weeks. Ketton returned to winning ways with a 4-3 success at Crowland Town, while Scott Spearink’s strike was enough to earn Langtoft United a win over Wisbech Town Reserves. AFC Stamground Sports' striker Dwayne Rankin challenges for a high ball in the 3-1 defeat at the hamds of Pinchbeck. Photo: David Lowndes. Jimmy Ward scored twice for Holbeach United Reserves in a 4-2 defeat at Stilton United and Scott Murthwaite of bottom club Thorney also scored twice in a 3-2 home defeat to Uppingham Town. Ritchie Baines, Simon Denning, Liam Rodden and Jose Alves netted for Stilton. Holbeach striker Tom Gosling was dismissed after collecting two yellow cards. Stilton had lost their nine previous Premier Division matches. Their previous win was also against Holbeach. Peterborough Sports Reserves, Premier Division title favourites in the eyes of some good judges, eased to a 6-2 success in the PFA Senior Cup against Deeping Rangers Reserves. Pinchbeck United goalkeeper Ricky Lovelace limps off early in the game at AFC Stanground Sports. Photo: David Lowndes. Karl Gibbs (3), Gerard Evans (2) and Dan Drane were the men on target. Sawtry are also through after a 3-1 win against Division One strugglers Baston. Leverington were hammered 6-0 at Linton Granta in the Cambs Challenge Cup. Crowland Town 3 (Valys, Virginijus, Ellis), Ketton 4 (Breakall, Rawlinson, Russell, Waldron). Langtoft United 1 (Spearink), Wisbech Town Res 0. Stamford Lions 3 (Thomas, O’Donnell, Travers), Netherton United 0. Stilton United 4 (R. Baines, S. Denning, Rodden, Alves), Holbeach United Res 2 (Ward 2). Thorney 2 (Murthwaite 2), Uppingham Town 3 (White 2, Turiccki). Peterborough Sports Res 6 (K. Gibbs 3, Evans 2, Drane), Deeping Rangers Res 2. Linton Granta 6, Leverington Sports 0.